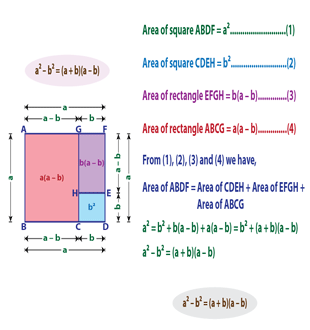 This collection of algebraic identities charts emphasizes the derivation of the identity with vivid geometrical representation. 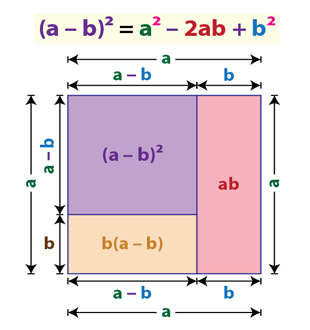 Learn the algebraic formulas as a precursor to the simplification of algebraic expressions. 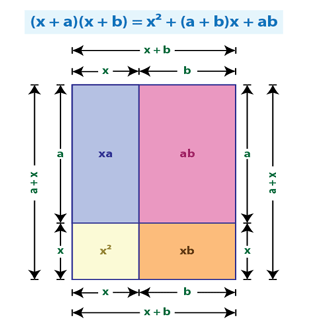 Included here are the charts for identities such as square of a binomial, difference of squares, product of two binomials, square of trinomials and more. The charts are extremely useful for students of grade 6 and grade 7. 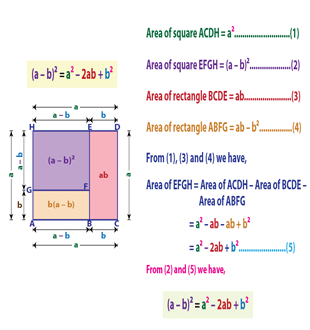 Familiarize students with the identity using these square of a binomial (a+b)2 identity charts, that comprise a clear illustration of the identity, followed by a self-explanatory derivation chart to reaffirm the identity. 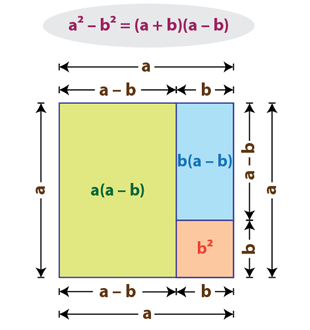 This set of square of a binomial (a-b)2 identity charts consists of a geometrical representation of the identity in the first chart, and its derivation stated clearly in the next. 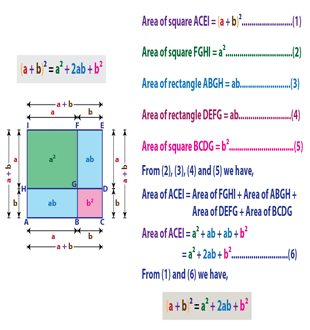 This set of two well-illustrated and easy-to-use charts contains the difference of squares a2 - b2 identity and its derivation. Learn the identity and get a vivid picture of the derivation of the identity as well. 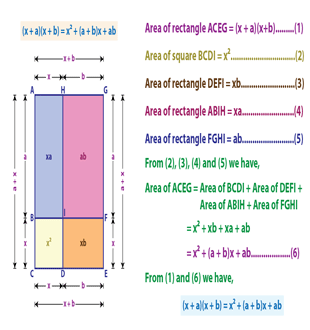 Incorporate these product-of-two-binomials x2 + (a + b)x + ab identity charts, presented in an organized way to provide students with a thorough understanding of the formula and its derivation. 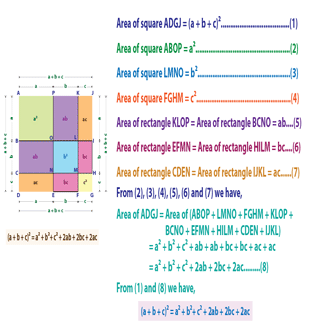 These ready-to-print square-of-a-trinomial identity charts are excellent visual tools that assist students in memorizing the identity and learning how to derive it as well. 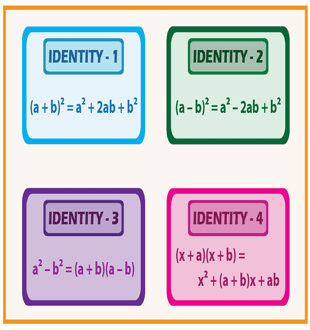 Recapitulate the identities with this handy standard-identities-chart consisting of the four basic identities. 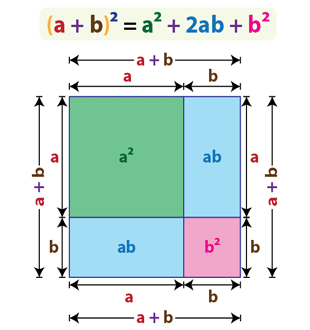 Use it as a reference to solve algebraic expressions. 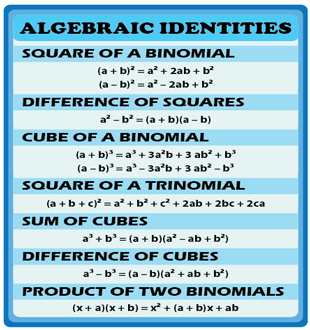 This chart is an assortment of all the frequently used algebraic identities. Display the chart or distribute it as a handout to reiterate the identities. 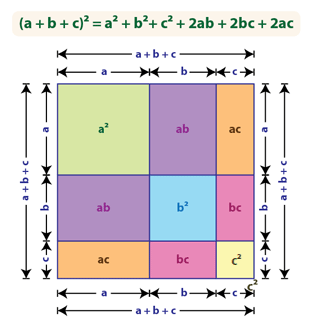 This chart comes handy in solving the algebraic expressions.